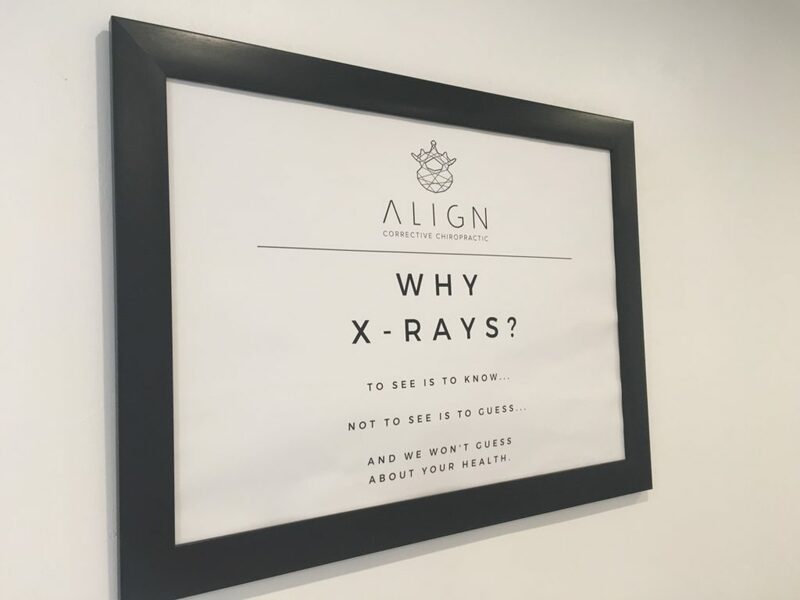 So you have just had your first consult at Align Corrective Chiropractic and a set of Spinal X-rays were taken. You are probably wondering what it all means. Why do we take Spinal X-rays, what are we looking for and how will our findings impact your chiropractic care? These questions will all be answered in this blog post so keep reading! The first thing we want to determine, when looking at your Spinal X-rays is, are there any signs of serious conditions or red flags that would prevent us from starting chiropractic care? Things like Cancer, serious spinal disease and trauma (even though they are uncommon) do occur and have to be treated with caution. I believe that Spinal X-rays are extremely valuable as they often show us what we otherwise wouldn’t be able to see. Once we have determined that chiropractic care is safe and the right choice for you, the next step is to analyse your spine. The first thing we look at is the alignment or shape of your spine. Each region of your spine has an ideal shape and alignment. For the purposes of this blog post I will be using the neck as an example. The research indicates that your spine functions best when it is in the ideal alignment*. A loss of the ideal alignment can lead to pain, dysfunction and eventual arthritic (wear and tear) changes. The following is a lateral neck X-ray (which means we are looking at the neck from the side). The ideal curve is demonstrated with the green curved line. 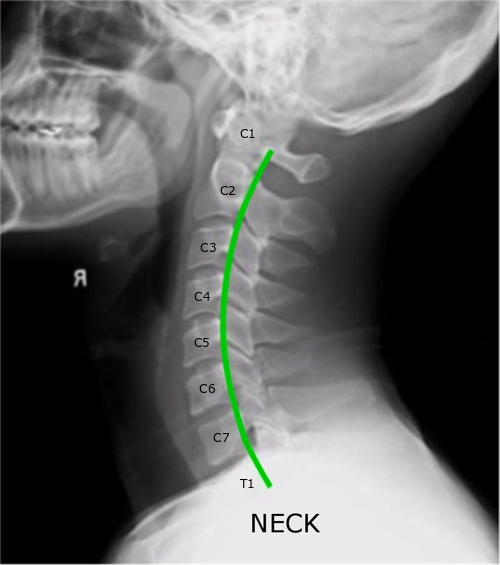 Each vertebrae from C1-C7 lines up with this green curve. This is what our necks should look like, and any significant deviation from this ideal should be addressed. We are also able to take specific measurements – the angle between each pair of vertebrae, the overall angle of your neck and the amount of forward head posture. Each measurement helps us give you the specific care that you need. The following is an example of a neck that has lost it’s ideal alignment. 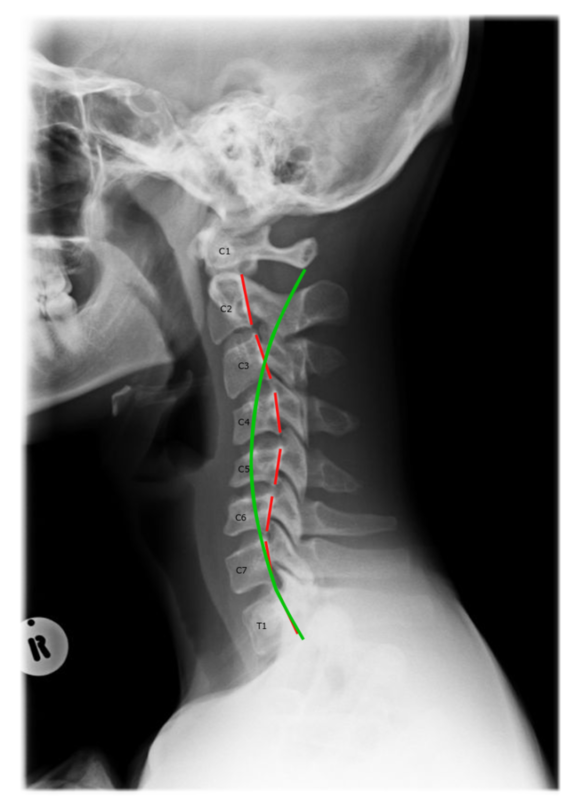 You can see the vertebrae (red lines) are actually bending the opposite way to the Ideal curve (green line). This is often referred to as a ‘loss of lordosis’. This increases the strain on the neck significantly and can result in a number of problems. This patient in particular had been experiencing frequent upper back/neck pain and headaches since childhood. He experienced symptom relief after his first Chiropractic adjustment, however this does not mean that the problem was fixed. It will take time, consistency and effort to change the shape of his spine. We are able to edit your X-rays too, with the same green and red lines to show you exactly how close, or far, your spine is from the ideal alignment. We will also take specific measurements which will be compared to the ideal. This gives us tangible, objective information that we can reassess in the future. The second thing we assess is the bony structures of your spine. Your vertebrae (with a few exceptions) should generally look like uniform square blocks stacked one on top of the other, as shown in the neck X-ray below. Certain diseases and trauma can change the shape of your bones. When your spine loses its ideal shape/alignment, extra strain is placed on the spinal structures which can result in wear and tear (arthritis) to these structures. A common sign of this is a change in the bony shape of the vertebrae. The vertebrae may become flattened or irregularly shaped. You may also see bone spurs, which are small outgrowths of extra bone. Your spinal joints are designed to move, so any change to the shape of the bone, or extra bone growth can restrict normal motion. This results in further degenerative changes. 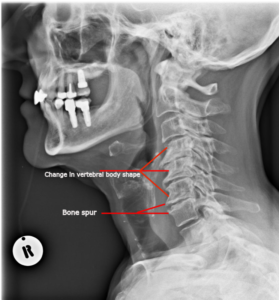 Take note of the changes to the shape of the vertebrae and the multiple bone spurs in the X-ray below. Next we will want to take a look at your disc spaces. 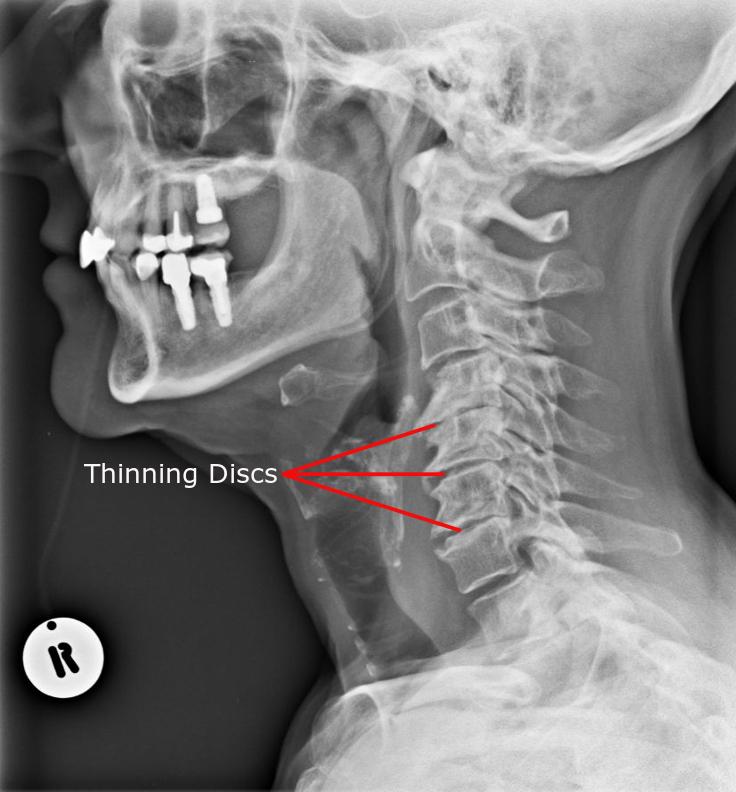 Your discs should look like dark, thick rectangular spaces between the vertebral bodies. Changes to this shape or space often indicate degenerative changes to the discs. MRI scans are often used to confirm disc disease/degeneration. In the below X-ray we have outlined each disc in yellow. In the following example, you can see that the disc spaces are substantially thinner than what they should be. This, combined with the change of shape of the vertebral bodies and the bone spurs, all point to severe degenerative changes. Take note of the shape of the neck, it has lost its normal C-shaped curve (Cervical Lordosis) and has developed a reverse curve (Cervical Kyphosis). This causes a huge increase of strain on the lower half of the neck (C4/C5/C6/C7) and this is most likely the cause of the degenerative changes. Many people think that degenerative changes happen due to old age. If this was the case, then every vertebra would be degenerated equally. The research indicates that the degenerative changes occur in the structures that are under the most strain. By correcting the shape of the neck to the normal curve (lordosis) we can remove the extra strain on the degenerative area and possibly prevent the degeneration from getting worse. How Will Your Spinal X-rays Impact Your Chiropractic Care? So now that we have assessed your X-rays, we have much more insight into your spinal structures. Our measurements give us a goal to work towards. They show us where your spine is not ideally aligned and enable us to tailor a specific treatment plan to correct these misalignments. We will show you your spinal X-rays at your next report visit. We will give you feedback on how healthy your spine is. Are there any degenerative changes? Any signs of a more serious problem? We will discuss your alignment/measurements and explain your options. With this in mind you can then make an educated decision on how to keep your spine healthy and in the best possible alignment. The following picture from this interesting research study demonstrates how a neck that is too curved, not curved enough or even reverse curved can all result in the same forward head posture. This is why we recommend taking Spinal X-Rays and not only relying on posture pictures. In my opinion if you are looking to improve your posture or make a structural correction it is imperative that we have an up-to-date set of Spinal X-rays. To view a short clip on why we take Spinal X-Rays, click on the link below.